Keeping your body fit and healthy is one of the few guaranteed methods to improve not only your health but also keep both your energy and mood up. Leg days might not be everyone’s favorite, I know I hated it during the first months, but it is an essential exercise that will keep you nimble and help maintain a healthy posture. One of the more popular lower body exercises you can do is the leg curl. You can easily find leg curl machines in the gym which focuses on developing the muscles on your hamstrings. Thing is, I’m an introvert and I prefer to workout in my lonesome. Going to the gym has not always been my ‘thing’. The good news is there are actually several leg curl exercise alternatives we can do right in the comfort of our own home. The main benefit here is to our hamstrings. I learned a while back that hamstrings usually lack in strength when compared to our quads. The reason is that it is actually quite hard to train the hamstrings naturally unlike quads. This is why specific methods of exercise were developed that only focus on strengthening our hamstrings, which we will be listing down below. The benefits of including this exercise into your daily routine, obviously, revolve around lower body strength. Leg curl exercise help build stability and tone your legs. It can also significantly improve your endurance, a must-have for marathon runners. The elderly will also benefit from this exercise as it can help them maintain a well-balanced posture for mobility. Leg curl machines is a gym equipment specifically designed for the sole purpose of training our hamstrings. However, proper care and preparation are required before hitting this equipment. The fact that it puts pressure on your knees at an unnatural angle increases the risk of injuries. While it definitely has its advantages, this is one exercise machine I do not recommend lightly to just about anybody. If you wish to work on your hamstrings without using this machine, there are alternatives you can do that require little to no exercise accessories at all. These can be done at home which is a godsend for people like me who prefer to exercise on their own or with just a few close friends or relatives. One of the best alternatives to using the leg curl machine when it comes to training your hamstrings is the stiff-legged deadlifts. It also helps improve lower back strength, abs, and glutes; benefits that using a leg curl machine won’t be able to provide. It is important to understand that this exercise will take a bit of practice to perform properly so make sure you start out with a manageable weight. Place a barbell (if you are using one) on top of an exercise step so that the bar is shin height. Position yourself close to the bars. Close enough that your shins are almost touching the bar. Steady yourself, contract your thighs and core muscles. Bend down at the hips but don’t bend your knees. Keep your back straight and steadily reach the handlebars. Keep your knees straight and use the overhand grip to hold the handlebars. Make sure the positioning of your hands is slightly wider in comparison to your shins. With knees locked, stand up straight until you have fully extended your hips. Maintain this pose for a second and slowly place the barbell back down, keeping your knees locked and bending only at the hips. For those who are using dumbbells, the same steps apply with the only difference in that you will be holding the dumbbells at mid-shin height. This exercise will require you to hook your legs on a stationary object. There are ways you can do this at home, like having a friend hold your legs or using the glute ham machine. This exercise is one of the more difficult entries in this list. The first time I did this exercise I found my legs to quite sore a couple of hours later. I advise you do proper warm-ups first to avoid injuries. Basically, you have a friend or a stationary object hold your legs down to the ground. You start off in a kneeling position then make sure your legs are fully secured and steady. Then, you slowly lower yourself forward down to a parallel position. Keep your cores tight, and pull yourself back up to the kneeling position. This not only works the hamstrings but also gives your glutes and lower back a good work out. If you wish to add a little challenge, you can hold two dumbbells to your chest. 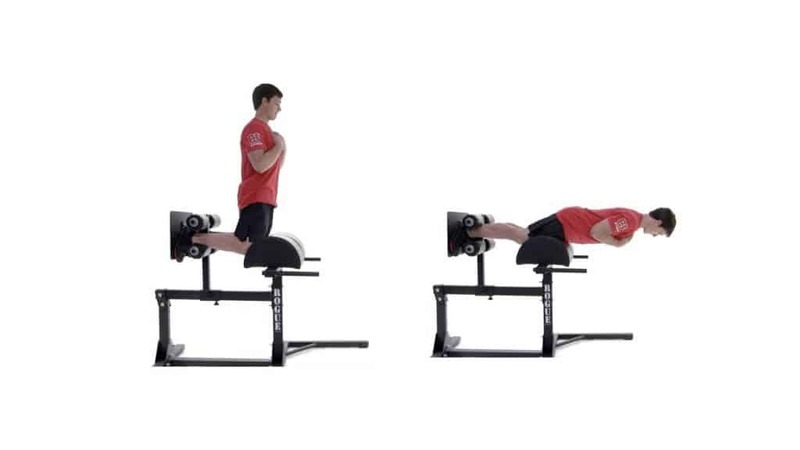 The glute ham machine also allows it to be adjusted up to a more challenging level. Kettlebell swings also require a bit of practice to be done perfectly. I have actually witnessed a couple of individuals do this exercise incorrectly. This should be avoided at all cost as doing an exercise routine, especially ones that require weight, improperly is a good way to injure yourself. 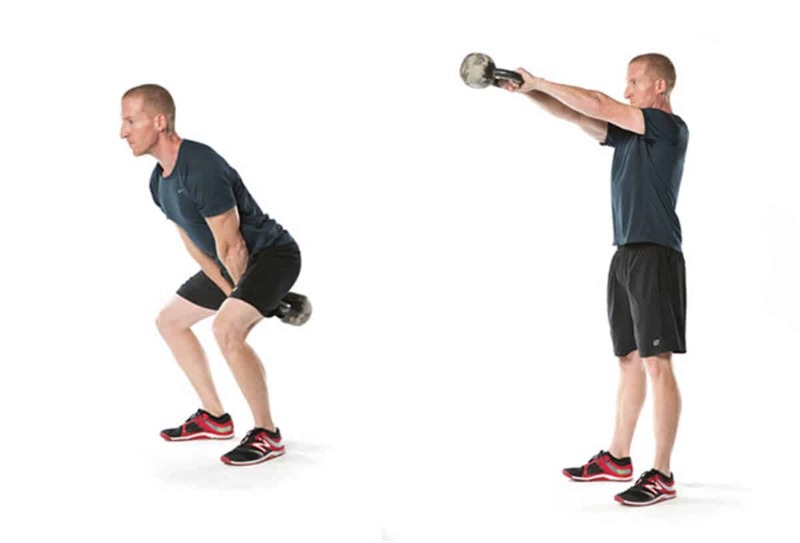 As the name of the exercise implies, you will be swinging that kettlebell around so be extra careful. There are two ways to do this exercise; you can use the squat position or the standing position. Doing the kettlebell swing exercise requires you to be in proper position. In order to do this, you need to stand with feet apart, between the width of your hips and outer shoulders is the best position for your feet. Hold the kettlebell but give it a slightly loose grip. This will allow the kettlebell to properly swing inside your hands. Now, hold your arms out parallel to the front. Keep your elbows locked and swinging it back and forth. Swing it forward, with peak height being parallel above your head. Swing it back down, go into a squatting position to allow the kettlebell to swing safely underneath your legs. This exercise targets the hamstrings, lats, and glutes. The most common weight lifting exercise is also one of the best alternatives to leg curls. This exercise looks simple enough but similar to the stiff-legged deadlifts, proper form is essential to make the most out of this workout routine. The deadlift requires the use of a barbell. For beginners, start with lighter weight and work your way up. With this exercise, your legs are basically the only muscles you need to use. Starting position is standing straight with both feet at width length apart. Lower yourself to grab the handlebars using only your glutes and hamstrings. You don’t bend at the hips with this one. Once you have lowered yourself down enough to get a proper grip on the handlebars, you will push your way back up using your leg muscles only. Keep your back straight during the whole routine. Beginners will quickly find this technique tiring on their legs but it is a great way to shape and strengthen your lower body. Just remember the golden rule with deadlifts: maintain proper posture. This exercise only requires you to lie down flat on the ground without any obstructions so you can do this almost anywhere at home. This exercise focuses on the hamstrings with your body being the weights. To begin this exercise, lie down flat on your back and bend your knees at a 90-degree angle. Your feet should be hip-width apart. Now, raise one leg upward as high as you can and hold it in that position. With your other leg as a stabilizer, you will raise your hips and lower back upwards as well. Keep the weight on the ‘stabilizer’ leg’s heel to maintain balance. Hold this position for 3 seconds and slowly go back down. Rinse and repeat. The recommended reps are 15 for each leg. We now return to the first entry in this list but with a little tweak that will improve results but also increases difficulty. The single leg stiff-legged deadlift pretty much follows the same rules as the stiff-legged deadlift except you will be utilizing one leg at a time. 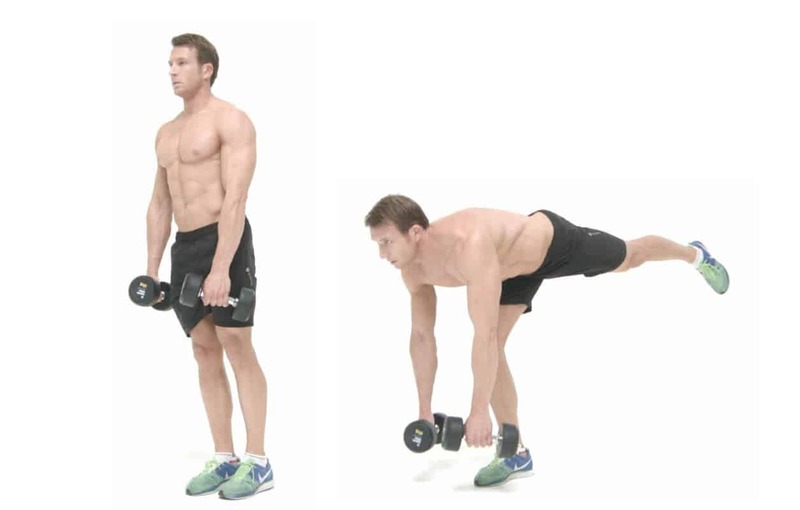 Using a dumbbell, slightly bend one knee and lift the other leg off the ground. Slowly move down at the hips, using the raised left leg as an anchor to balance you as you move down. Once you have reached the ground with your dumbbell, use your left leg to steadily swing you back up. Remember to keep your back straight and your knees steady. You will need to get your hands on a stability ball for this one. Fortunately, these exercise accessories are quite cheap so finding one should be no problem. One great advantage of having a stability ball is that it can emulate the benefits of a leg curl machine at a cheaper price. The catch of using a stability ball is that you will need to gauge the intensity needed in your workout routine yourself. To do this exercise you will need to lie down, flat on your back, on the floor. Place the stability ball underneath your legs. For best results, make sure your legs are at a 45-degree angle. You begin by steadily raising your hips while pulling the stability ball towards your lower back. Your knees should be bent at a 90-degree angle once you reach the peak position. Slowly lower your lower back while pushing the stability ball away back to the starting position. This exercise is not only designed to work on your hamstrings but also help trim your core muscles and improve posture as well. This exercise requires a bar, you can even use a bar without any weighted plates if you want. Bare handlebars usually weight around 45 lbs. so you beginners shouldn’t encounter any problems. You start this exercise by standing straight up and placing the handlebars over your shoulders. Once you have comfortably positioned the handlebars behind your head and rested it on your shoulders you can move on to the next step. Plant your feet at hip-width apart and make sure you have absolute stability. Lean forward, bending at the hips and pushing them back as you move your upper body lower. Keep your head looking forward. Once you have reached a 90-degree angle or once you have reached a ‘bowing’ position, you can slowly push your body back up. Make sure you use your glutes and hamstrings to push your upper body back up to a standing position. Take it slow and steady to allow your lower body muscles to be fully utilized. Another hamstring exercise that does not require any additional exercise equipment, the bridges is a simple and highly effective workout to improve lower body muscle and stability. The bridge is more akin to a stretch rather than an actual high-intensity exercise routine but the benefits that it can offer is quite impressive. First, begin by lying down flat on your back. Keep your feet at hip-width apart and make sure the soles of your feet are resting flat as well. Start the exercise by slowly raising your hips upwards using your glutes to do so. Hold the position once you reach the top for around 3 seconds, then slowly lower your hips back to the ground. Repeat for at least 10 to 15 per set. The advanced version of this is the Single Leg Hip Extension exercise from earlier. You can also increase the challenge by using weights placed on top of your stomach. The Bridge is a great hamstring exercise that you can virtually do anywhere. If you don’t have access to a leg curl machine or wish to replicate the exercise at home then you can try the Dumbbell Leg Curls. This exercise only requires you to use a dumbbell. It follows the same idea behind a leg curl machine but at a barer bones approach. Basically, leg curl machines apply pressure on your legs via weights that you can adjust. Now, replace that intricate weighted machine with a dumbbell. You start this exercise by lying down stomach first on the floor. You place a dumbbell between your feet, making sure you have it secured to prevent it from slipping off. Slowly bend your knees to raise your feet along with the dumbbell. Aim for a 90-degree angle bend. Once you have reached this angle, slowly lower your feet back to floor and repeat. You can also try this on an inclined bench for an added challenge. As you can see, there are several alternatives to a leg curl machine that does not require you to go to the gym. Not only do these alternatives work your hamstrings, but they also give benefits to your glutes, lats, and core muscles. Just remember to maintain proper posture and always do a quick warm up before diving into your full-on workout routine.